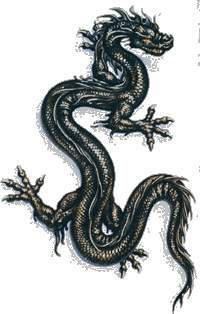 The dragon is a homiothermic reptile. In otherwords, it is a warm-blooded creature and its body temperature is controlled internally. This characteristic enables it to adapt to the different climates of its very extensive habitat and to maintain its activities both day and night throughout the year, as it is not dependent on the warmth from the sun like the other reptiles. 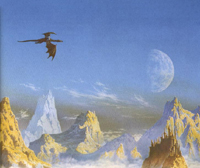 The dragon generally has wings, and its bones are hollow, like a bird. There are dragons, usually ancient survivors from the distant past, with stumpy legs and no wings. These rare survivors of a remote era are intelligent and fairly aggressive, and belong to a single species known as 'worms of the deep', a species on the verge of extinction. This creature lives for a very long time. There are records of dragons who have lived for five hundred and even a thousand years, but there are no known cases of dragons who have died from old age. On the other hand, they die from accidents, certain diseases or as a result of the actions of their most relentless enemy: man. The worst disease is scale corrosion, which can be fatal. 'Senile dementia' is more common among Earth Dragons, while acute gastritis iron virginae affects mainly the Water Dragon, who has an extremely delicate stomach. Despite its strength, the dragon loses some of its agility with age, easily falling prey to the singular and terrible dragon-killer, the armor-plated Ichneumon. This swamp dweller, which Pliny describes in its Historia Naturalis as a spindle-shaped mud fish with a sharp snout, covered with tough plates, is the dragon's mortal enemy. The Ichneumon burrows between the dragon's scales and, using its sharp snout, tunnels through the tender flesh until it reaches the entrails, which it devours, killing its victim. The dragon can talk, and its natural language is Latin, a tongue which is innate in the dragon species, but it has no difficulty in learning and expressing itself correctly in the vernacular of the region in which it lives. Dragons have the same senses as humans; sight, smell, hearing, touch, and taste. But some have a sixth sense which is being able to "read" the emotion of another being. Their regular five senses are incredibly sensitive. For example, the sense of smell is about 100 times more sensitive than a bloodhound dog. They can smell and hear a person or animal from a couple miles away! Their sixth sense is very accurate at close range. If a person or animal is feeling a strong emotion, such as fear or hate, it will register very strongly to the dragon, even if it is not in visual range of it. This is where dragonfear comes from. Dragonfear is an all encompassing, frozen-in-place fear that the dragon causes upon the animal or person seeing a dragon. The dragons sometimes use this advantage to beat its foes, such as thieves or slayers. Only the very bravest or very dim-witted are not affected by this terrible fear. This is usually an aura around evil-minded dragons, but in a friendly dragon, such as the Faerie Dragon, this aura is non-existant. The dragon can be a huge creature depending on the breed. The one shown here is roughly 20 feet long with a wingspan of 35 feet. This type of dragon has extremely small ears, large eyes, spines down its back, and a bone-type spade at the end of its tail. All dragon breeds are different. Some have long ears, and no spade. One type has a fleshy-type triangle-shaped spade and no scales; it has tough leathery skin instead. But, most dragons have scales of some sort. 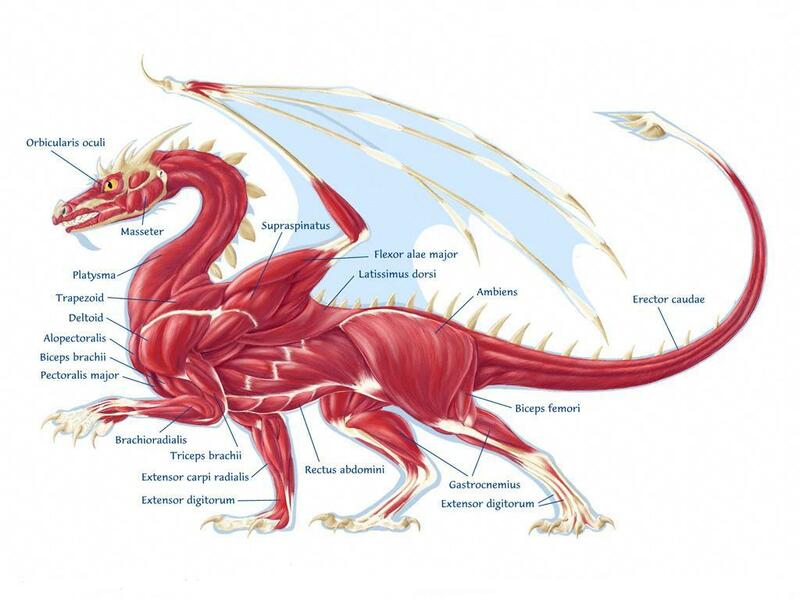 Western dragons have more muscles then their Eastern cousins. This is mainly due to their massive flight muscles that have to lift their weight into the sky with the thrust of their wings. The main wing muscles are the Supraspinatus and Flexor alae major. 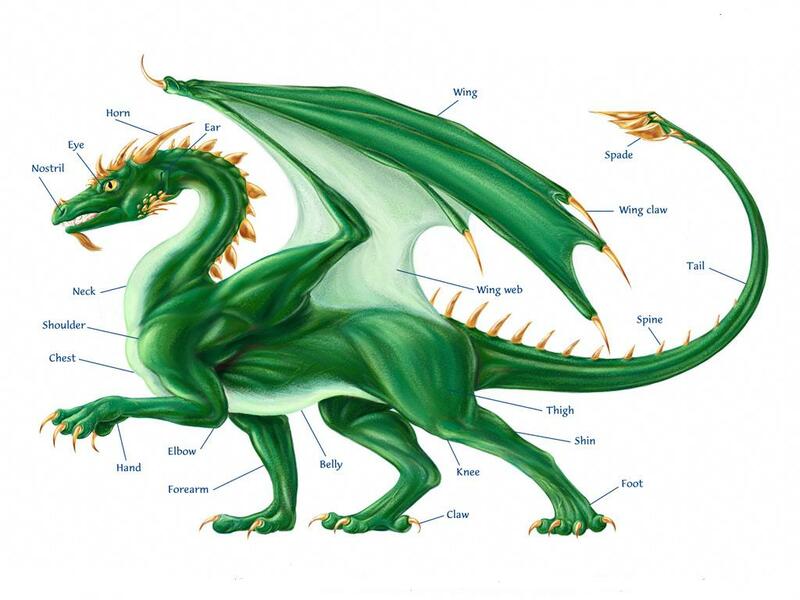 Notice that the actual wing does not have many major muscles, it is all near the chest area. Other large muscles account for a very strong tail, and rear legs. 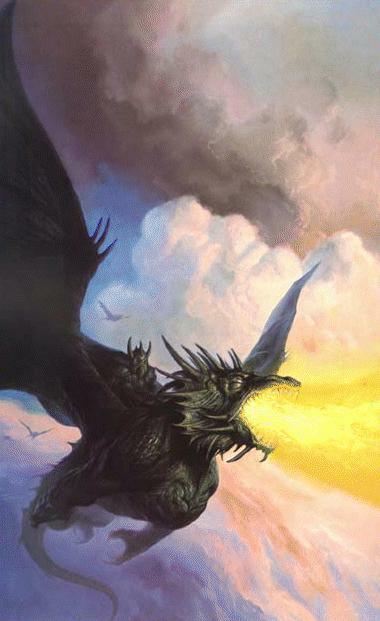 The Western dragon could easily hold a human male's weight while in flight. Also notice the large jaw muscle Masseter, this muscle can easily crush bones. Fire is the thing that makes the dragon most feared. It's a hellish belch of flame that can turn flesh and bone into ash. Though, not all dragons breath fire. Some have freezing cold breath, others have acid, and some don't use their breath as a weapon at all! HOW DO THEY BREATH FIRE? It all starts when the dragon catch their prey. When dragons eat, they digest the food in a regular stomach. The digestion then continues in a second stomach that breaks down the food even further. After the dragon's body has used all it can from the second digestion, the body then turns the leftover food and acid into a byproduct of hydrogen. The dragon can hold the hydrogen in various large glands in it's body for later use, and can call upon it at any time it needs to. When the dragon needs to belch it's flame, the glands release the hydrogen into the lungs where it mixes with other various chemicals the body creates. Once this mixture finds oxygen, it burns very quickly at extremely hot temperatures. The dragon usually has enough hydrogen in its body for about three spits of flame, but that should be plenty for anything coming up against a large dragon. This explanation is about the same for dragons that breath other types of breath. Their bodies just break down food into different compounds.